Aeroflex Int. Inc. resilient shock mount. Wire rope. 3.957" c-c mount holes. 0.90"H (no load). 4.423"L. 280 lb. max load. NSN: 5340-01-435-5104. Resilient shock mount. 1/4-20 threaded studs. 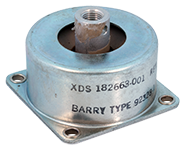 1.65"D x 1/4"H.
Mechanical Rubber Products rubber disk shock mount. 45º chamfer on center hole. 3.25" diameter, 1.25" inner diameter, 0.68" high. We do not know the weight range of this material. NSN: 5330-01-201-4803. Electrical insulator. Rubber mount, elastomer polychloroprene. 1.575" semi-circle, 2-3/8" square block. NSN: 5975-01-034-5536. 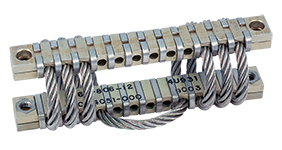 VMC (Vibration Mountings & Controls, Inc.) stainless steel, helical wire rope isolators shock mount. Compression / sheer / roll 45º. 100 pound load. 1-3/4"H x 5"L. 1/4 - 20 inserts for mounting @ 4.5" centers. 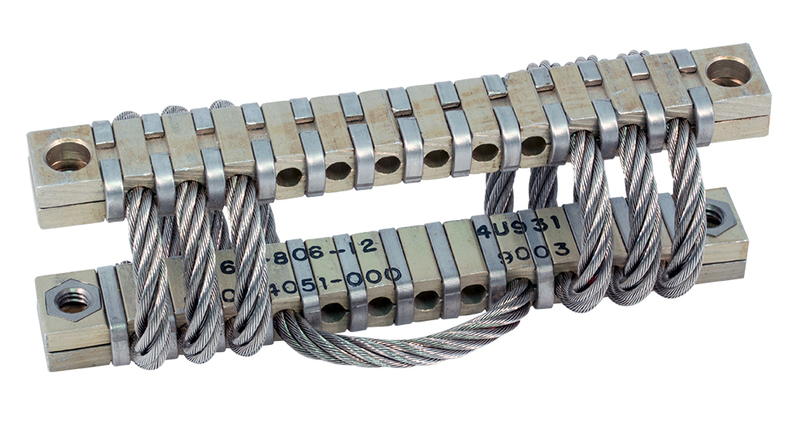 United Technologies wire rope resilient mount. 25 lbs load rating. 0.090" diameter rope. 1" high x 1-1/2" coil. 1/2" x 4.39" mount flange. 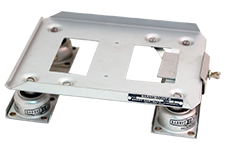 3.95" c-c mounting holes. 5340-00-385-9258. 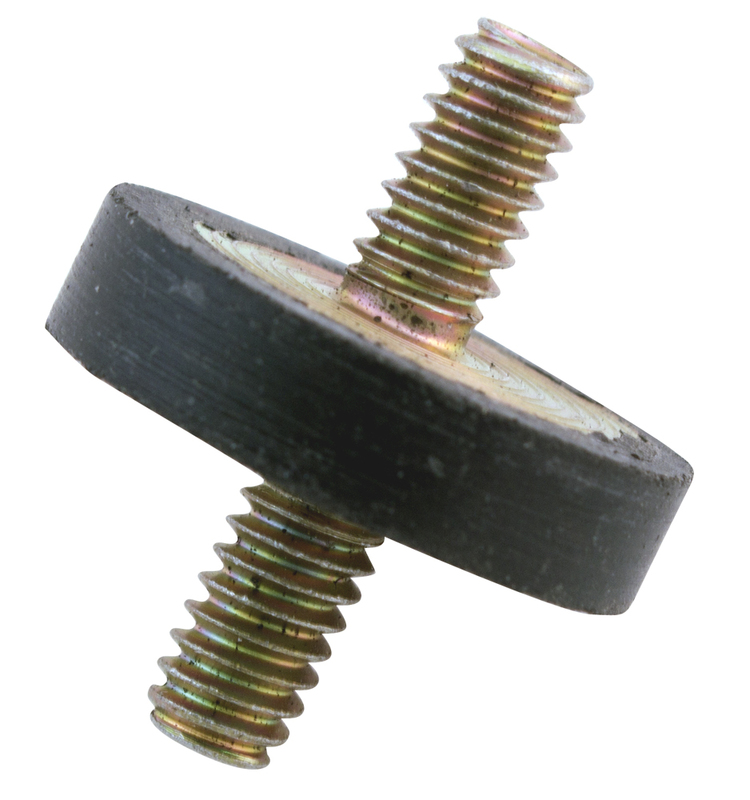 GE rubber pad shock mount. 1/4"H. 3" x 3". 1/2"D hole centered 1" from top. Barrymount shock mount. 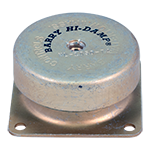 Load/frequency range: rated at 6-10 lb load. For 25 to 30 CPS. Max load rating: 25 lb. 2-3/8" x 2-3/8" x 1-1/2"H. XREF: 5340-00-582-2964. Aeroflex Int. 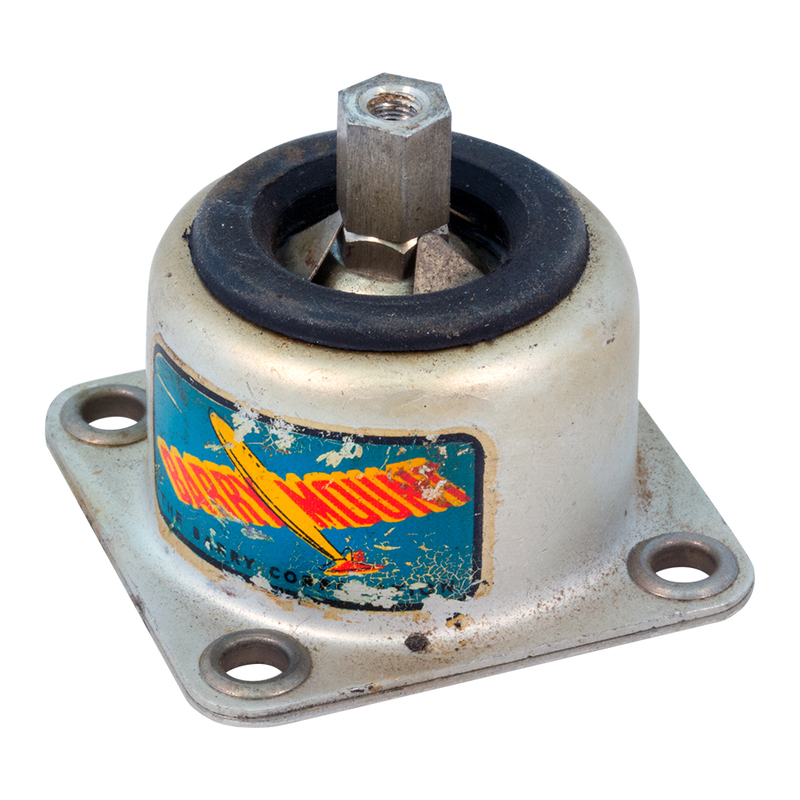 Inc. circular arch, wire rope isolators for aircraft. 1/8" wire ropes. Load range = 5 - 20 lbs each. Aeroflex CA4 series. 2" high uncompressed. 3" diameter base, 1.5" diameter top plate with 1/4" x 20 hole. We were recently shocked to find a large stash of this great mount. Original Barry Mounts new in boxes but probably 40-50 years old! 20-40 pounds weight range each or 80-160 pounds per set of 4. 1-1/2" high, no load. 2-3/8" square base, 1/4" mounting hole at center. 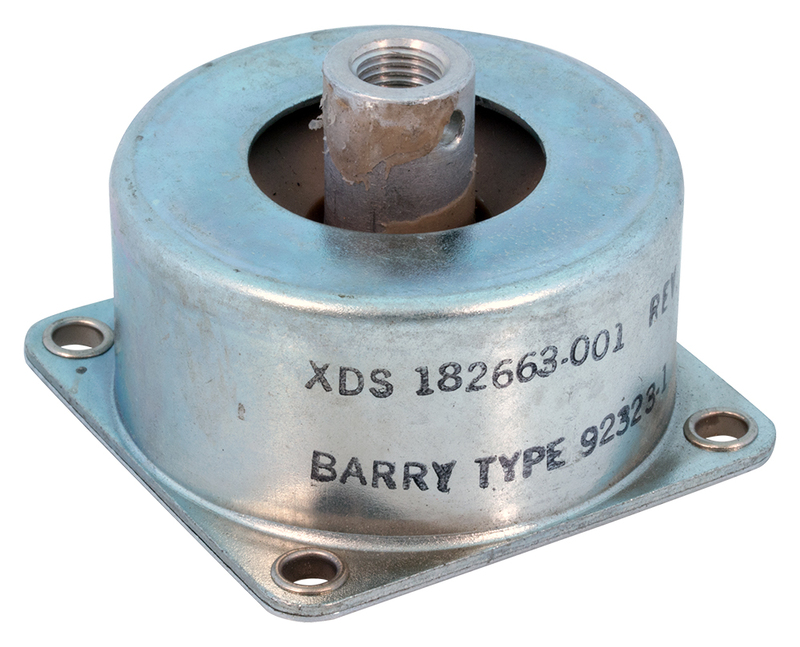 Mounting holes are 7/32" on 1-15/16" centers. Diagonal distance of mounting holes is 2-3/4". U.S. Rubber shock mount. 2 - 10 lbs range. Center hole (0.255" diameter) unthreaded. May use 1/4" through-bolt to secure equipment. 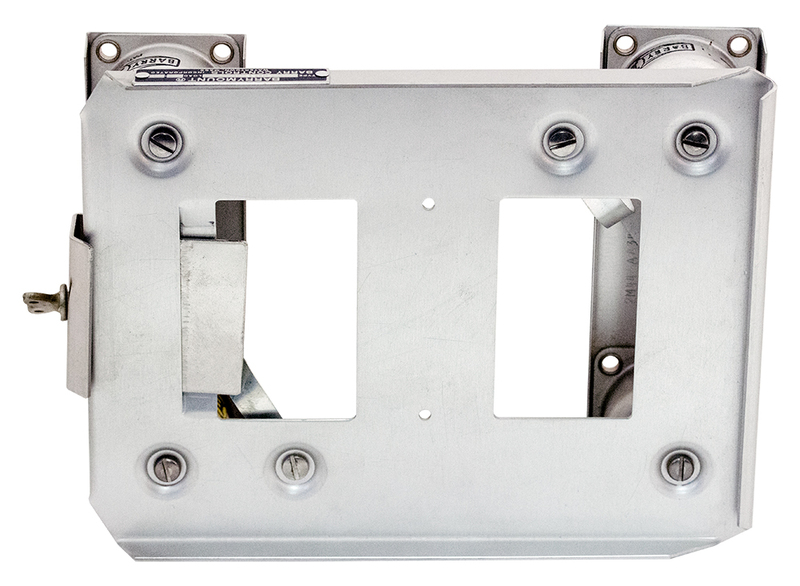 2-3/4" square base plate, 1-1/8" high. 1.93" c-c mount holes. Cadmium plated. Chalk residue / preservative rubs off to shiny surface. Manufactured in the 1950s. 2-1/2" c-c mount holes. 2-3/8" high. New, old stock. Cleans up nicely. Barrymount shock platform. 12 - 20 lbs (16 lb nominal). Four M44-AA-4 mounts. 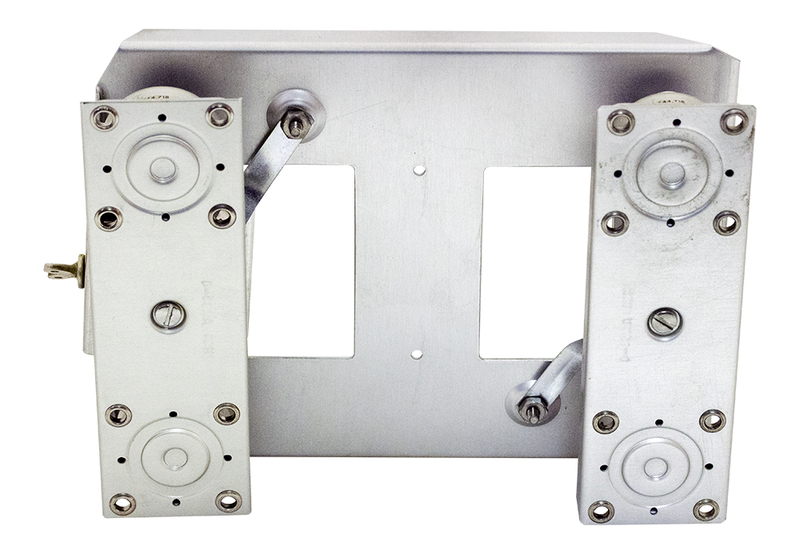 6" x 8" aluminum mount. 2" high. 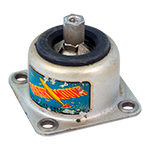 Reduces shock to expensive electronic equipment when mounted in vehicle or aircraft. Barry Controls cup mount shock mount. Series 1000. Aluminum construction. 38 - 60 pound load rating. 100 pound max. 1/4 - 20 tapped center. Barry Controls cup style shock mount. Zinc plated. 25 - 35 lbs load rating. 0.011 - 0.032" deflection. Solid rubber resilient member. 2-3/8" x 2-3/8" x 1-1/8"H. 1-15/16" c-c mounting holes. 0.195" diameter. 1/4 - 20 mounting hole. Barrymount shock mount. 4 to 7 pounds each. 2.4" square base, 1.5" high. 10 - 32 thread. 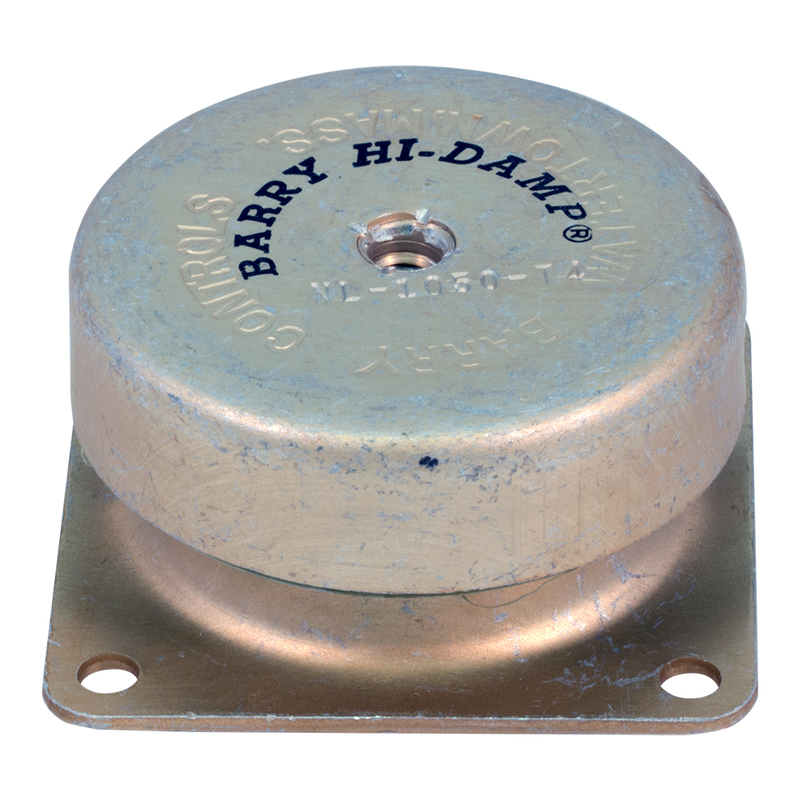 Barry shock mount. 175 pounds (150 - 200). 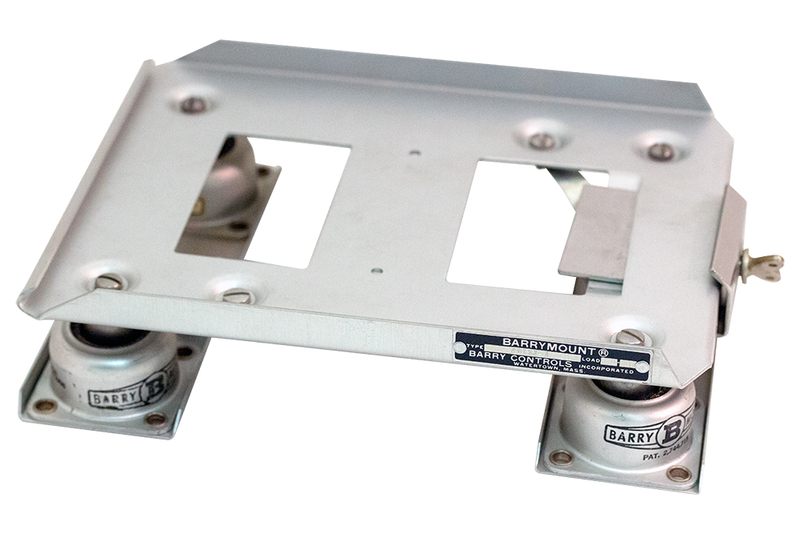 2.38" x 2.38" x 1.6"H. 3/8 - 24 mounting hole. 1.95" mounting centers. Made for Xerox, P/N: 182663-001 Rev. B. Mfg. Barry Controls. 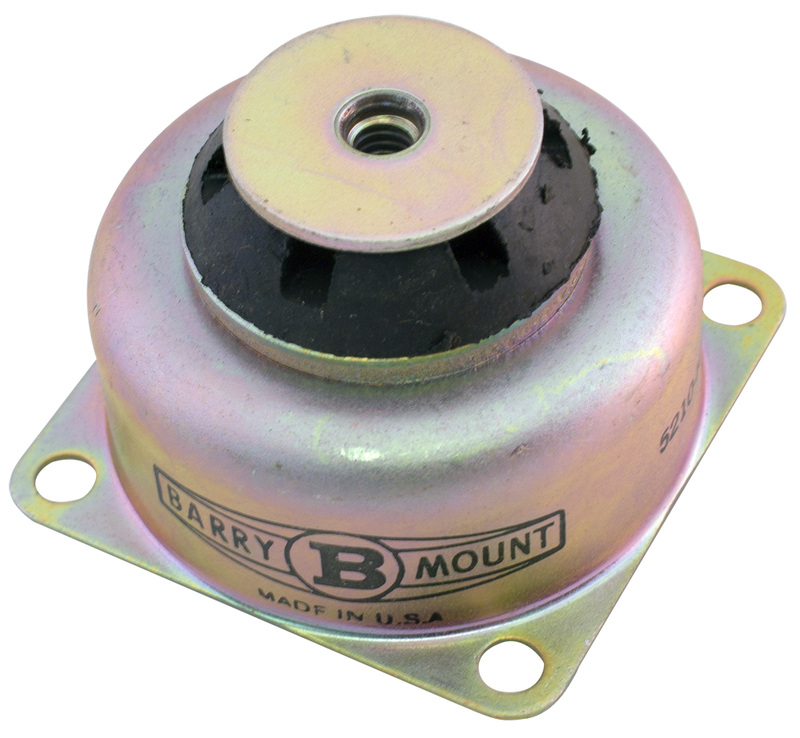 Barry Mount shock mount. 1/2 lb load rating @ 3/64" deflection. 1.813" x 1.813" x 1.5"H. 8 - 32 mounting hole. 1.375" mounting centers. New, old stock from the 1960's. NSN: 5340-00-664-1575. Rubber shock mount. #8 brass stud on top & bottom. 9/16" diameter x 1/2" high. 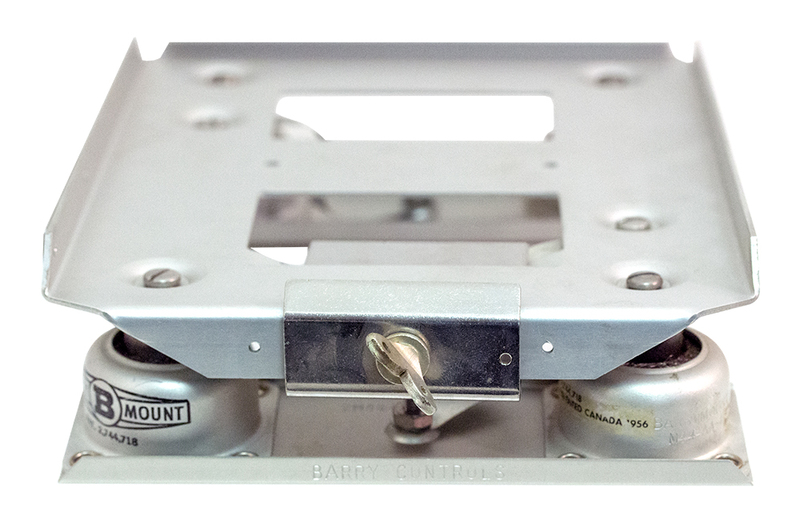 Giant shock mount handles 550 pound loads. 6-1/2" center to center on ear holes. 4-1/2" high. Steel frame. Rubber cushions. 550 lb load rating at 15 Hz. Cage 81860. Rubber shock mount. 5/8" high. 1/2" diameter flange. Gates P/N: 426-0001-000. Rubber shock pad. No internal seat. 1-1/4" diameter x 0.4" thick, 0.566" overall height. 3/8" diameter hole. 1/2" outside diameter shoulder. Gates P/N: 424-0126.